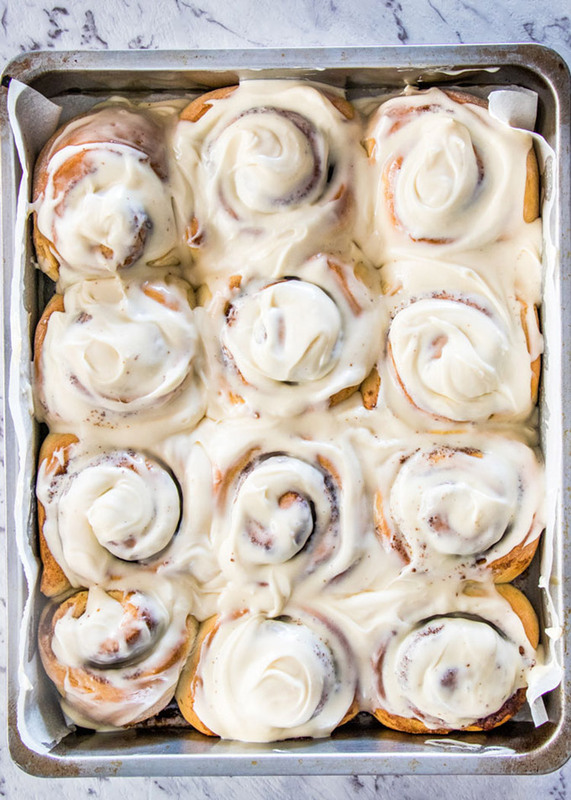 These incredibly delicious Cinnamon Rolls can be in your hands in only 1 hour with NO KNEADING required! 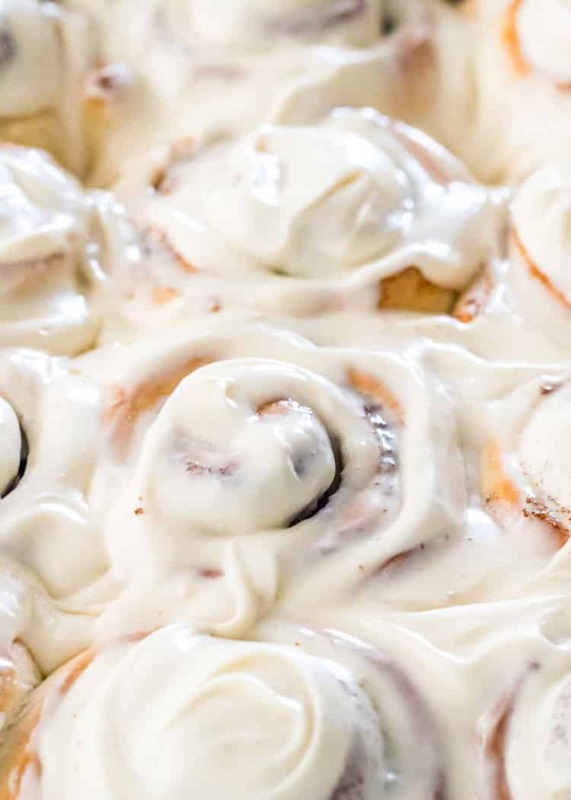 Topped with my fabulous cream cheese icing, these might be the best cinnamon rolls you’ll ever have! These cinnamon rolls are SERIOUSLY the easiest, most delicious cinnamon rolls you could ever have! So here’s the thing. 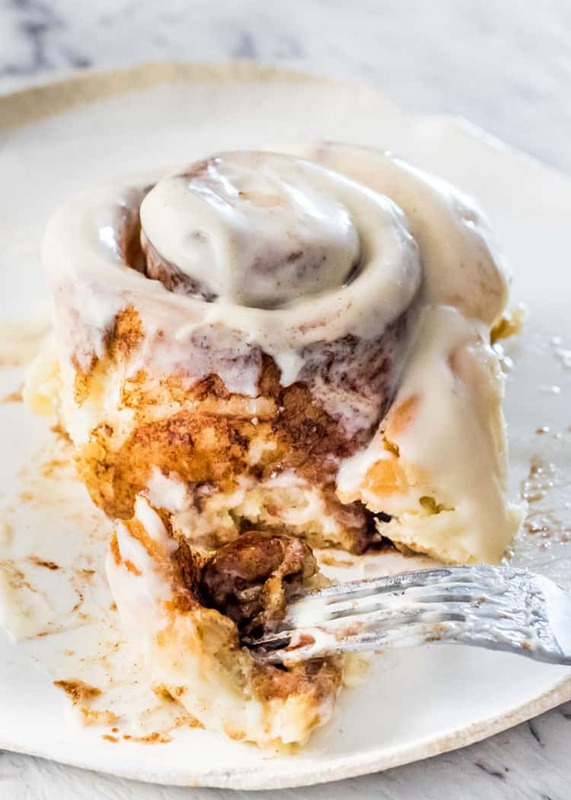 If you follow my other blog, Jo Cooks, you know that I’m kind of known for my cinnabon cinnamon roll recipe. And there’s a reason for that, and that reason is that those rolls are outrageous. 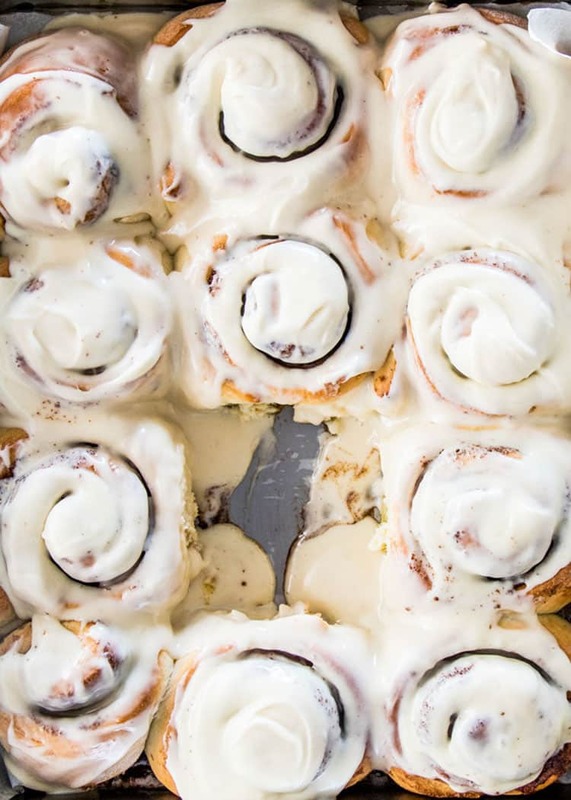 Hundreds of people have said they’re better than the real Cinnabon rolls. I’m just saying! They really are! But I got this crazy idea to make them in 1 hour. And as I was starting to think about how to make them in 1 hour, I realized I don’t have my Kitchen Aid Mixer because we’re moving in a month or so and most of my kitchen stuff is already packed and in storage. Bummer! But then a lightbulb went off in my head and I thought about doing a no knead version. YES! I did the No Knead Hot Cross Buns not too long ago and they turned out incredibly soft and delicious and I thought, why not Cinnamon Rolls? Sometimes I amaze myself, seriously. Well, it worked! No knead works!! 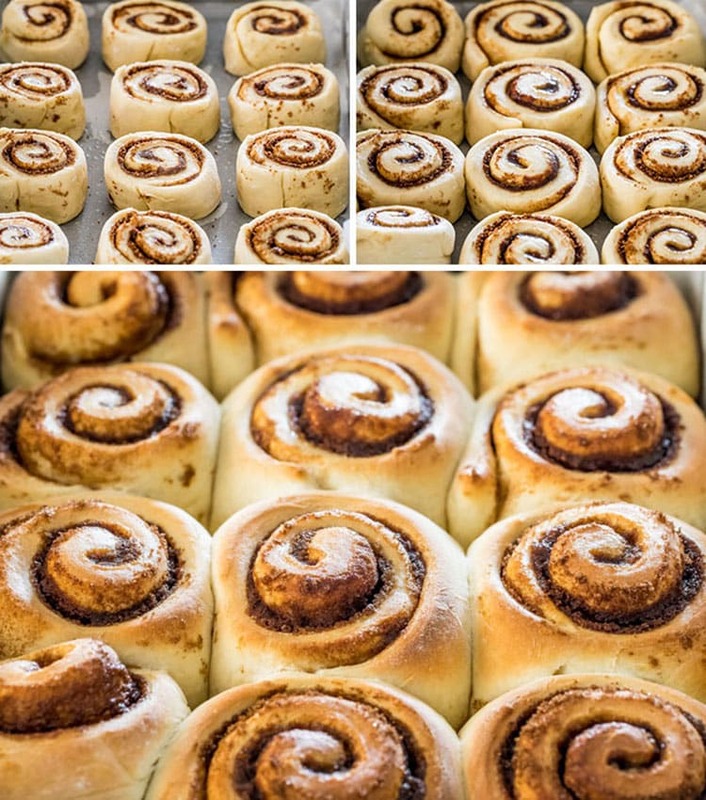 You seriously end up with super soft cinnamon rolls and so good. Which makes me wonder. All my life I’ve been told by my mom, mother in law, others that in order to get soft fluffy rolls or breads or whatever, you need to mix/knead until you’re blue in the face. So all my life I’ve followed that rule. Now I wonder if I’ve been fooled, because every time I make something where no kneading is required, the end result is phenomenal! I had to take a lot of pictures during this process because these pictures make me drool, so I apologize for that. Come to think of it, I have some more waiting for me in the fridge, so I’m going to go help myself to a cinnamon roll! Hope you give these a try, because they’re outrageous. You’ll thank me! If you try this recipe, please let us know! Leave a comment, rate it and tag a photo #cravinghomecooked on Instagram so we can see it. I always love to see what you guys come up with! These incredibly delicious Cinnamon Rolls can be in your hands in only 1 hour with NO KNEADING required! 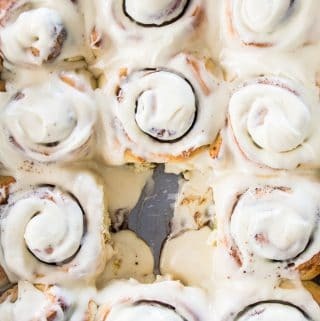 Topped with my fabulous cream cheese icing, these might be the best cinnamon rolls you'll ever have! In a medium size bowl whisk together the water with the instant yeast and 1 tsp of sugar. Let it rest for 5 minutes. Add the eggs, milk, sugar and melted butter to the yeast mixture and whisk until well combined. In a large bowl combine the flour with the salt. Pour the yeast mixture and using a wooden spoon stir until well combined. You should have a thick sticky dough, see video. Cover with plastic wrap and let it rest for 10 minutes. See notes for tips. Preheat your oven to 350 F degrees. Line a 9x13 inch baking pan with parchment paper. Spray some cooking spray over the bottom, this will help the parchment paper stick to the baking pan. Roll the dough out onto a well floured surface, until it's approximately 16 inches long by 12 inches wide and about 1/4 inch in thickness. In a small bowl whisk together the brown sugar with the cinnamon. Spread the 1/2 cup of butter over the entire surface of the dough, then sprinkle with the cinnamon sugar evenly over the surface of the dough. Starting at the long edge, away from you, roll the dough down to the bottom edge. Cut the dough into 2 inch slices, or use floss as seen in the video. Place the rolls into the prepared baking pan, 3 x 4. Let the rolls rest for another 10 minutes and you will notice they will rise until there is no more space between them. Place the baking pan in the oven and bake for 20 minutes or until golden brown. While the rolls are baking make, prepare the cream cheese icing. Add the cream cheese and butter to a mixing bowl and mix until smooth. Add the remaining ingredients and mix until smooth. If the icing is a bit too stiff add 1 tbsp of milk. Ice the rolls immediately when they come out of the oven with the cream cheese icing. Active dry yeast can also be used in this recipe, but you may need more time to let the yeast activate and for the dough to rise. Please note that normally if you're using instant yeast you do not need to activate it in warm water with sugar, but I usually do this just to test out my yeast and make sure it's still good. TIP: To speed up the dough rising process, heat your oven to 200 F degrees. Turn off the oven and place your dough as specified in step 4 in the oven with the door closed. This will ensure a warm environment for your dough and the dough will rise fairly quickly, assuming the yeast was good. To freeze unbaked rolls, complete everything up to and including step 8, then wrap the pan in two layers of plastic wrap. Freeze for 8 hours up to 6 weeks. The night before you want to bake the rolls, thaw them out in the refrigerator, still wrapped. They will thaw overnight. 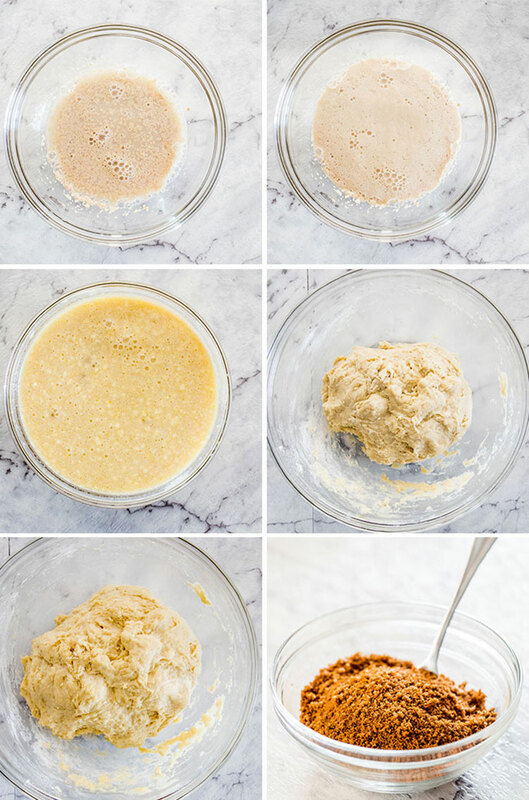 Finish the rest of the steps to bake them. You can but you can omit the salt. Self rising flour also has some baking powder in it, however I would still add the yeast to this recipe and follow it as instructed. Thank you for the lovely recipe Joanna. My rolls turned out well, even though they didn’t look quite as neat as yours! After the feedback of other reviewers, I reduced the amount of cinnamon and they were still lovely and spicy. Very impressive. Glad you liked them, Helen! Thank you for the lovely recipe Joanna. My rolls turned out well, even though they didn’t look quite as neat as yours! I do find it confusing knowing what weight 4 cups of flour is equivalent to in Metric. There are different conversion tables on the internet, some saying a cup of flour (US) is 120g, some saying a cup is 140g (US) and in Australia, a cup is 150g. I had to add a lot more flour after proving as it was way too sticky to handle. Not sure if that affects the texture? Is it possible to include the Metric weight of ingredients in recipes in future? Or could you upload a separate conversion table for those of us who use Metric measurements? After the feedback of other reviewers, I reduced the amount of cinnamon and they were still lovely and spicy. Very impressive. Thanks Joanna. So sorry about my confusion. How embarrassing! Of course I noticed the metric conversion link just after my first comment was posted. That’s great so I have reprinted the recipe with the correct metric quantities. I’m going to try them again to see if I can improve my technique. Your photo steps are really appreciated. I need to try the hot cross buns recipe now too. Cheers. Helen. I suppose you could, they’d be a bit smaller though. The filling is probably gritty from the brown sugar, other than melting the brown sugar with the butter, not sure how to make it smoother. I have made these twice but both times they were very gooey and didn’t bake up as individual rolls. Should I increase the amount of flour? Yes, if you find the dough is too sticky, add a bit more flour. My husband raved about these rolls so I will definitely make them again. The cream cheese frosting is the best! Is there a way to get a smoother cinnamon filling within the rolls themselves? They are wonderful, but filling seems to be a bit grainy, did I do something wrong? I can’t imagine why it would be grainy. Perhaps from the brown sugar, it’s the only thing I can think of. My buns didn’t rise so were very heavy. I’m trying to figure out why. I checked and the yeast wasn’t outdated and it was ‘instant’ BUT I added the salt to the liquid that contained the yeast instead of adding it to the flour by mistake. Does salt kill yeast? Salt can kill yeast, but you can still test your instant yeast in a bit of warm water with a bit of sugar. If you see it start to foam it’s good. Going to try these today, they look amazing! One question, if you roll out the dough to 12×16 and cut them 2 inches thick how do you end up with 12 rolls? Hi John! As you roll out the dough it will actually stretch a bit and it’s quite a bit wider than 16 inches. I don’t usually measure out the dough, what I do is cut it in half first, then each half in half, then each quarter in thirds, this way you end up with 12 even rolls. 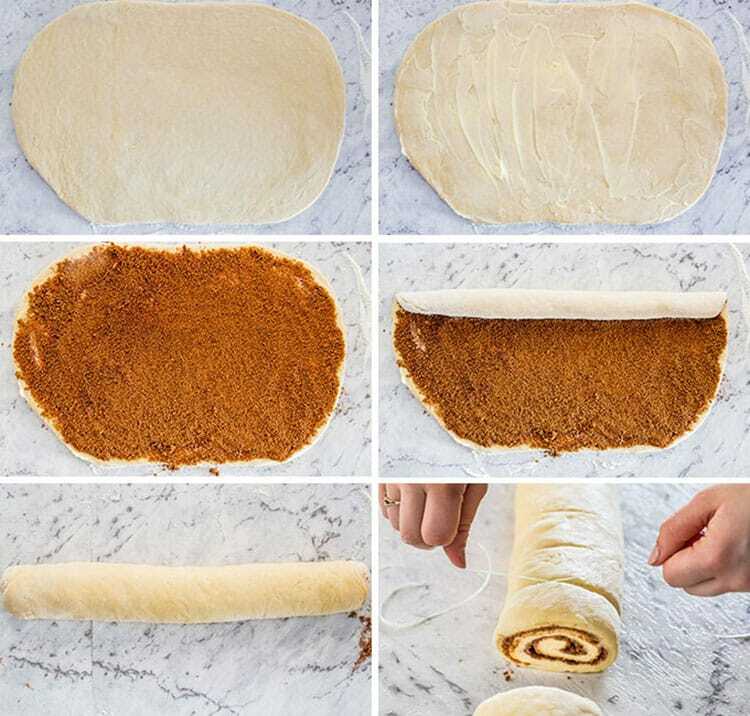 Could you add pumpkin puree to make pumpkin rolls? How much would you add? What adjustments would be needed? Yes, you could probably add about 1/2 cup of pumpkin. Without experimenting with it I couldn’t tell you exactly, but I would probably add a bit more flour instead of cutting from the butter or milk.